Asparagus lovers rejoice – the start of spring marks the arrival of luscious Australian-grown asparagus as fresh, crisp and delicious spears hit supermarket shelves nationwide in early September. Locally-grown Australian asparagus has enjoyed the sunny winter just as much as we have, with the drier conditions ideal for growing and harvesting across all growing regions. Australian Asparagus Council President, Alex Motta says this year’s crop is on track to be one of the best, with the good year of preparation meaning the early season spears are delicious, crisp and firm. “The dry conditions over winter have been ideal for growing conditions, meaning our crops are extra juicy and fresh. This season we’ll see plenty of variety with thick, medium and mini spears on offer for customers. The thick spears in particular are tender and perfect to grill on the barbeque,” said Mr Motta. Asparagus is not only delicious but is also bursting with nutrients. One serve of asparagus, which is approximately three to four spears, has a quarter of an adult’s daily vitamin C needs, as well as providing B vitamins, potassium, and fibre. 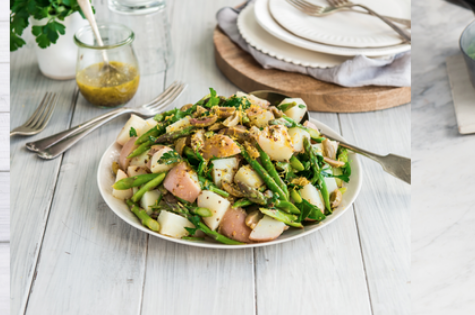 Waistline friendly – Asparagus is low in kilojoules and contains no fat or cholesterol, making it the perfect addition to any diet, particularly if you’re trying to shed those winter layers. Pregnancy partner – Asparagus is a great source of folate, with one serving providing more than 20% of our daily needs. Folate is particularly important for expectant mothers as it supports normal cell division and tissue formation. Immune booster – We don’t just need to look to fruit to get vitamin C, a serve of asparagus provides 25% of daily vitamin C needs for a healthy immune system. Age gracefully – Asparagus has a number of bio-active compounds, including antioxidants like rutin and beta-carotene. Research from accredited practising dietitian Glenn Cardwell suggests that these bioactive compounds keep us healthy, well into old age. Tasty and thrifty – Not only does asparagus taste great, it’s also very affordable so is a perfect grocery addition for the whole family. Did you know? Asparagus thrives in warm weather and the harvesting process is labour intensive. The spears are cut by hand, usually at night and early morning when it’s cooler in order to retain maximum freshness. In ideal temperatures, the spears can grow as quickly as 1 cm every hour! Love the cooking content on your site! You know, most businesses get traffic from their blog, and we feel that you could use a little boost, since you are not blogging weekly yet. You can have your new article to post on motherpedia.com.au starting at $10 in as little as 5 business days! You are receiving this email because the contact form at motherpedia.com.au is open to the public.